Food Enzymes Market size was over USD 2 billion in 2016 and is estimated to exhibit over 7.5% CAGR from 2017 to 2024. Rising consumer awareness regarding nutritional and health benefits of food enzymes will drive the industry growth. Food & beverage industry has witnessed a strong application outlook for quality improvement and eliminating the deficiencies from the products. These enzymes are extensively used in bakery applications for reducing the protein flour level in crackers and biscuits, standardizing bread quality, and ensuring uniform browning of the bread. This will positively influence the food enzymes market over the next eight years. Various end-users such as packaged food units and frozen food manufacturing industries are increasingly adopting these additional extracts for better product standardization and uniformity. The processing units make extensive usage of specialty additives to carry out environment-friendly processes, resulting in reduced raw material wastage, further escalating the revenue generation. Food enzymes are used as biocatalysts to increase the production rate. Moreover, they are highly required in alcoholic and non-alcoholic beverages to break down pectins present in the plant cell walls. These benefits will propel the industry growth till 2024. These additives are used in a variety of emerging applications including processed foods, bakery, and dairy. High demand for shelf life extension and optimization of production will remain key properties. Fermentation is a trend that has gained prominence in the food industry. The edibles are fermented, that results in the creation of numerous enzymes, amplifying their strength. Furthermore, high usage of these additives to enhance bioavailability of minerals, stabilization of beverages, and minimization of off-odors will induce immense potential to the industry growth. Lack of standardized regulatory guidelines may hamper the industry growth over the coming years. Barriers in the brewing industry are another factor negatively impacting the product sales. Moreover, excessive costs associated with the R&D activities will further pose a challenge before the global market participants. However, the competitors are focusing on developing cost effective methods for their production. Carbohydrase is expected to capture highest volume share of over 45% by the end of 2024. The product includes numerous ingredients such as Cellulase, Pectinase, Amylase, lactase, etc. that are vital in food and beverages consumed on a daily basis. High usage of Amylase owing to its benefits such as easy modification & optimization of manufacturing processes, less time consuming, and cost effectiveness will support the industry dominance. Moreover, cellulase is being increasingly used for dairy and beverage applications, further strengthening the market penetration. Phytase is likely to grow rapidly, witnessing over 7% CAGR from 2017 to 2024 owing to rising consumer awareness regarding their health benefits. These extracts increase the body’s ability for assimilating and absorbing the vital minerals such as magnesium, calcium, and iron. Moreover, it considerably reduces the negative impact of phytic acid in the body. Its high adoption owing to its importance for digestive process and bone health will further support the growth of phytases demand. Food enzymes market from beverages is anticipated to account for over 30% of the global application by 2024. High product usage due to rising demand for beverages across the globe will primarily contribute towards the revenue generation. These extracts increase the processing capacity and enhance the economy in wine and juice industries. Moreover, they increase the yield of any beverage, eliminate insoluble materials, and accelerate its clarification. High usage in brewing applications will further support the industry growth. Bakery applications are likely to grow rapidly, exhibiting over 8% CAGR in revenue terms over the next eight years owing to rising usage of food enzymes for reduction of protein level in biscuits, crackers, and other bakery products, maintenance of bread quality, improving dough stability, and ensuring proper browning of the bread. 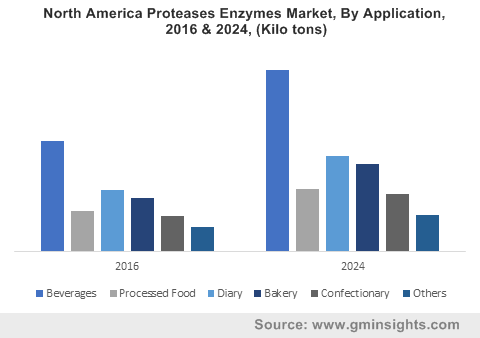 Food enzymes market from processed products will also grow considerably due to its improved product lifecycle characteristics. North America is anticipated to dominate the global demand, crossing USD 1.3 billion sale by 2024. Strong demand for healthy and highly nutritional diet products, especially in U.S. will primarily contribute towards the revenue generation. Rising consumption of fortified cereals along with increased meat consumption, specifically among middle class population will further support the regional dominance. Increasing demand for processed product is another factor positively impacting the industry growth till 2024. Asia Pacific market will grow significantly, exhibiting more than 7.5% CAGR from 2017 to 2024. Rising consumer awareness regarding product benefits along with high acceptance from various applications such as dairy, beverages, confectionary, and processed items will majorly support the regional growth. Rising demand for convenience eating product owing to increasing disposable income in developing countries such as India will further escalate the revenue generation. Rising consumption of RTE items will positively impact the regional industry growth. 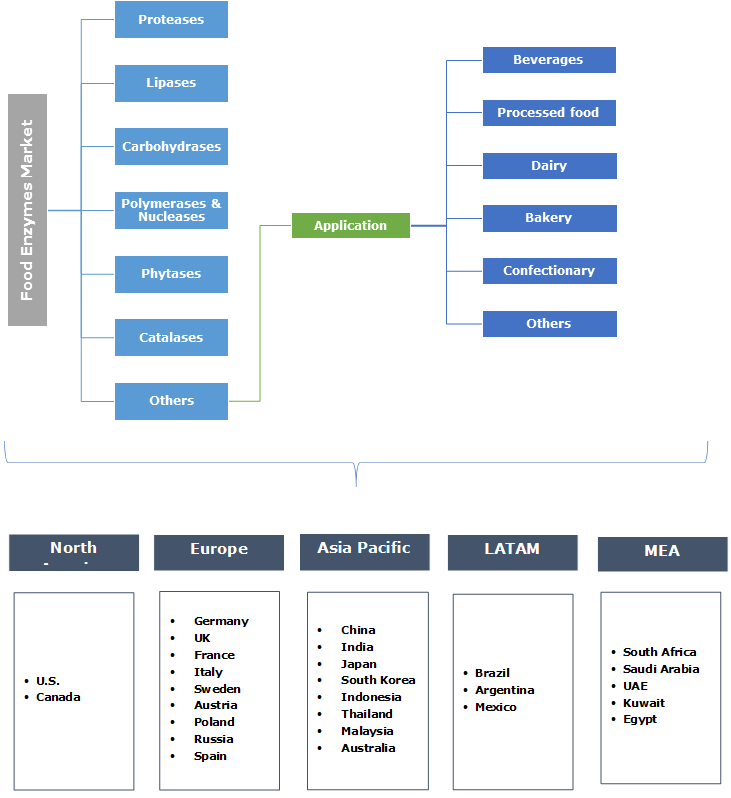 BASF, Royal DSM, Enmex, Advanced Enzymes, Danisco, AB Group, Lumis Biotech, Aumgene Biosciences, and Codexis Inc. are among the prominent participants in the food enzymes market share. Other noticeable players include Chr. Hansen, Specialty Enzymes and Biotechnologies, Hayashibara Co., Thermo Fisher Scientific, and Enzymes Solutions. Partnerships and collaborations are among the key strategies adopted by the competitors to enhance their foothold. For instance, in April 2015, Royal DSM extended its partnership with an ingredient distributor, IMCD N.V. to include France, Germany, Poland, Nordics, UK, Ireland, Benelux, etc. This partnership helped the company to enhance their product and technical offering, thereby increasing their customer base. New product development is another strategy implemented by the industry players to enhance their prominence. For instance, in July 2017, DSM introduced an enzyme Tolerase G, for improving glutton free bread. The product is permitted to use in health supplements by EU for the consumers that follow gluten free diet.